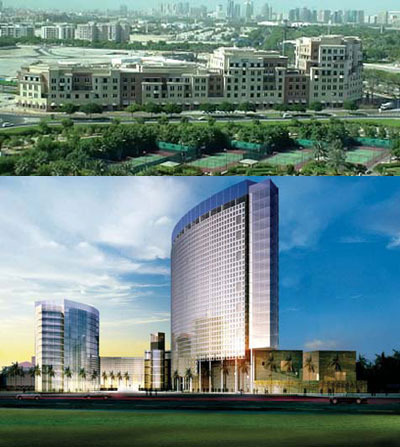 The Ibn Sina building in Dubai Healthcare City houses clinic space and medical and administrative offices (top). An artist’s rendering of the university hospital (below) that will be part of the same complex; Harvard Medical International (HMI) advised in designing the 400-bed facility, projected to be completed in 2011. 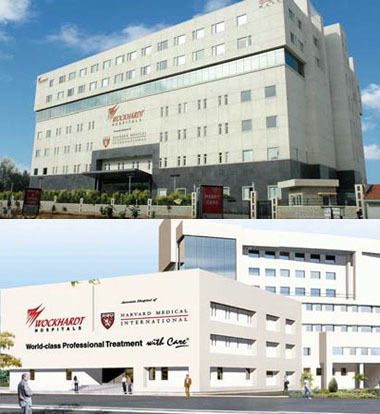 HMI affiliates from the Wockhardt Hospitals system in India include (top) a facility in Mumbai with a planned addition (in an artist’s rendering), and another (bottom) in Bangalore. There is a revolution afoot in international healthcare. Wealthy foreigners still come to the United States—to the Mayo Clinic, say, or to Harvard-affiliated hospitals in Boston—and pay full freight to be treated by the world’s top doctors. But changes in U.S. visa policy, in light of September 11 and the Iraq war, have made such trips more difficult; consequently, these patients increasingly seek world-class healthcare closer to home. Harvard has had a booming business advising in the creation of such hospitals. Harvard Medical International (HMI), created in 1994 to generate revenue for Harvard Medical School (HMS), has projects in 20 countries on five continents. But just as demand is heating up, the University is pulling back. In February, it announced a provisional agreement to transfer HMI to Partners Healthcare, the parent organization for two of the largest Harvard-affiliated teaching hospitals. The announcement allows HMI to come out of a holding pattern, freeing it to enter new contracts. But Andrew A. Jeon, M.B.A. ’89, HMI’s president and CEO since December 2007, says leaving Harvard is beneficial for other reasons. As University administrators also note, Partners operates hospitals, while HMS does not. And as HMI has grown, it has found itself in a Catch-22: the better it did at making money, the more questioning of its worth it faced in some quarters. Dissatisfaction reached critical mass in 2006, as HMI was losing its champions within the University: HMS dean Joseph B. Martin announced plans to step down in October of that year, and the presidency of Lawrence H. Summers, an ardent supporter of the Dubai project in particular, came to an early end. Interim president Derek Bok brought to Massachusetts Hall a skeptical view of Harvard’s involvement in commercial enterprises—his books include Universities in the Marketplace: The Commercialization of Higher Education, which warns against allowing the profit motive to compromise universities’ academic mission. And in the wake of huge federal fines against the Harvard Institute for International Development (another Harvard-run provider of international consulting services) following alleged misconduct by leaders of its economic advising work in Russia, and the institute’s dissolution, University leaders reviewed controls over all overseas projects. Harvard vowed to evaluate all its freestanding “centers” on a regular basis and convened a task force that considered the University’s international priorities; Domínguez, Madero professor of Mexican and Latin American politics and economics, chaired this task force in 2004 and 2005. In July 2006, Domínguez joined the provost’s office, and a report on HMI from an external review committee—comprising people from outside HMS, appointed by Martin—landed on his desk. The report judged HMI’s activities insufficiently academic, citing a number of factors including, says Domínguez, the finding that HMI work did not count in promotion and tenure considerations for HMS. (Not everyone agrees with this assessment. Robert K. Crone, who was HMI’s president and CEO from 1994 until 2007 and now works in the higher-education practice of the Huron Consulting Group in Boston, says work for HMI has factored into two promotions to full professor at HMS in the past year alone.) The external review committee’s findings led Harvard to commission McKinsey & Company to recommend “options” for HMI’s future, says Domínguez. The McKinsey report, he says, provided additional justification for severing ties with HMI: it found that three-quarters of HMI’s work could be classified as consulting, not educational, activities. By all accounts, when Walker professor of medicine Jeffrey S. Flier became HMS dean last September, HMI’s fate had already been decided. (Flier declined to comment for this story, deferring to Hyman.) And so, if the agreement becomes official—as both parties said was imminent at press time—HMI’s 60 employees will become Partners employees, and the new organization will be known as Partners-Harvard Medical International (PHMI), for the purpose of new contracts, for the first five years. (Administrators from the University and Partners give different answers regarding whether Partners will have the option to negotiate using the Harvard name beyond that initial period.) PHMI would honor all existing contracts under their original terms, and employees who have HMS affiliations—such as Jeon, who is an instructor in anaesthesia—would keep them. As Harvard leaves this market, other universities are rushing in. Johns Hopkins has a robust international consulting presence; Cornell has even opened a branch campus of its medical school in Qatar—students receive M.D. degrees from the university, just as they would if they attended the main campus in Manhattan. The difference, Domínguez and other administrators say, is that Harvard does not own its teaching hospitals, and so is not in a position to advise anyone on how to operate hospitals. Much discussion has focused on whether HMI loses or gains from the transition, but this tabulation is missing a factor, says Henry Rosovsky, Geyser University Professor emeritus and former dean of the Faculty of Arts and Sciences, who held an ex officio seat on the HMI board of directors for 10 years as a member of the Harvard Corporation. “The question may also be, does Harvard lose anything?” HMI “improved the quality of medicine in many parts of the world,” says Rosovsky (who is president of the Harvard Magazine board of directors). “That doesn’t seem to me to be such a bad activity for the Harvard Medical School or for the University to engage in.” Facilitating the delivery of top-notch healthcare, even to the relatively wealthy, he says, raises the standard of care for everyone in a given region, directly or indirectly, through improving the quality of facilities available and the education level of local doctors. What’s more, the model that says medical advances develop in the United States and ripple out to the rest of the world may be outdated. Those who have worked on HMI projects are apt to say they gained as much knowledge as they imparted. This was the case for Thomas H. Lee Jr.—a Partners executive who holds teaching appointments in medicine and health policy at HMS and HSPH—when HMI sent him to Japan to speak to doctors about aspirin and heart disease. American physicians recommend that people at risk for heart disease take aspirin daily, but the Japanese doctors Lee met protested that clogged arteries were much less common in their patients than were hemorrhagic strokes caused by ruptured blood vessels—a condition that aspirin makes more likely.